A model for local control of RAS activity within the kidney. High levels of angiotensin II (ANGII) in circulation, derived from angiotensinogen (AGT) generated primarily by the liver, are associated with (i) increased ANGII in the kidney, (ii) upregulation of AGT in the proximal tubule epithelium, (iii) increased levels of AGT in the tubular lumen, (iv) generation of ANGII requiring angiotensin-converting enzyme (ACE) expression in the brush border of the proximal tubule (PT), and (v) increased excretion of AGT and ANG peptides in urine. Within the kidney circulation and the tubule lumen, ANGII binds to AT1 receptors (AT1Rs) stimulating AGT transcription in renal epithelial cells and influencing the synthesis and activity of epithelial solute transporters with critical actions to influence body fluid volume and blood pressure. These transporters include NHE3, the major luminal sodium transporter in PT epithelia, along with paracrine stimulation of downstream epithelial transporters such as ENaC and PENDRIN in the collecting duct. 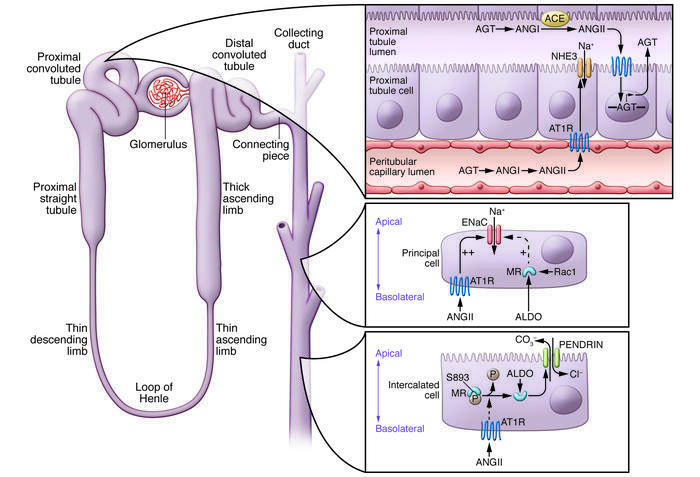 In the collecting duct, control of sodium transport involves complex interactions between ANGII, acting via AT1Rs, and aldosterone (ALDO), acting via the mineralocorticoid receptor (MR). In principal cells, ANGII and ALDO both stimulate the abundance and activity of ENaC, but direct effects of ANGII seem to predominate. Rac1 signaling may also stimulate ENaC, independent of ALDO. In intercalated cells, ANGII influences responsiveness of the MR to ALDO by regulating dephosphorylation of the MR at S893, allowing ALDO to bind, leading to activation of PENDRIN and enhanced chloride and sodium reabsorption.